Catching up to the garden at the end of what has been a perfect spring. Despite a few days of high humidity, it’s been mostly sunny and breezy, with about half an inch of rain falling every week. Not quite enough, but close. Here’s what’s been happening. In the vegetable garden, the sugar snap peas were bearing beautifully when they were attached by aphids and it was all over. This is the second year this has happened after many years of success. 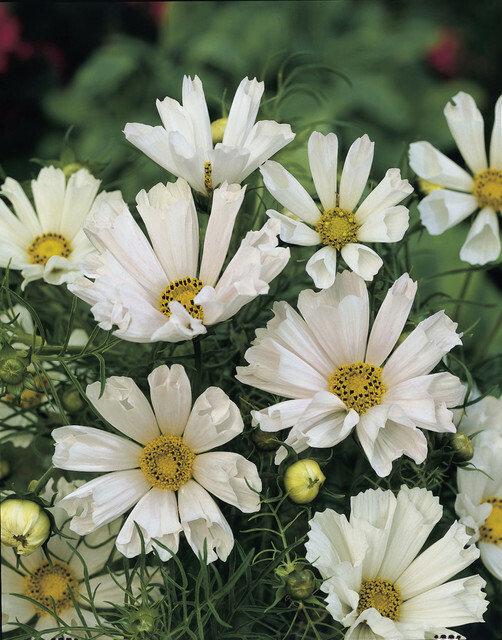 I’ll try planting them somewhere else next year and hope for the best. 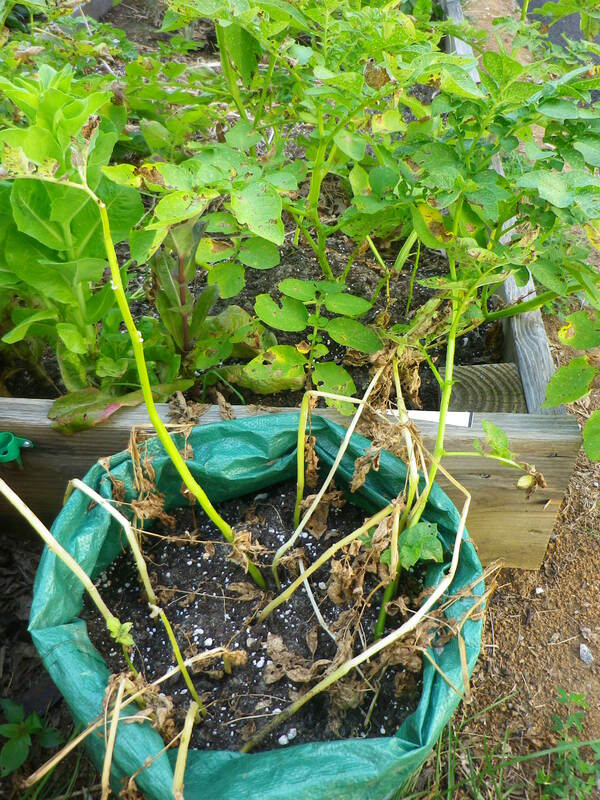 The potatoes – Russian banana fingerling potatoes from John Scheepers – are doing pretty well in the raised bed, despite some sort of fungus or rust or something on the leaves, as you can see from the photo below. The ones in the potato bag were beautiful until they suddenly died. 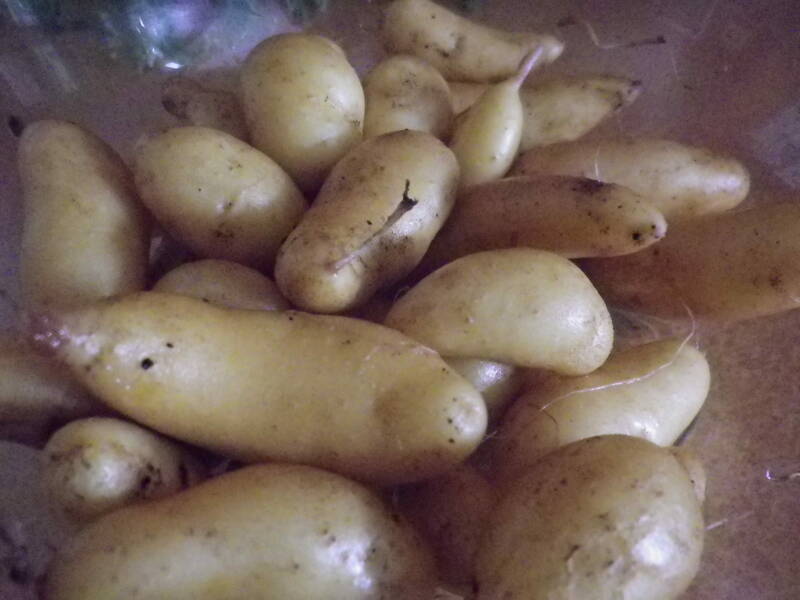 Nevertheless, I was able to harvest these tiny beauties and hope for more from the raised bed later on. Ya-ya carrots have germinated. Basil is thriving, as is the self-seeded bronze fennel. The tomatoes – cherry red and another one – are just mucking along since I left them in containers for too long and they got parched and wizened. 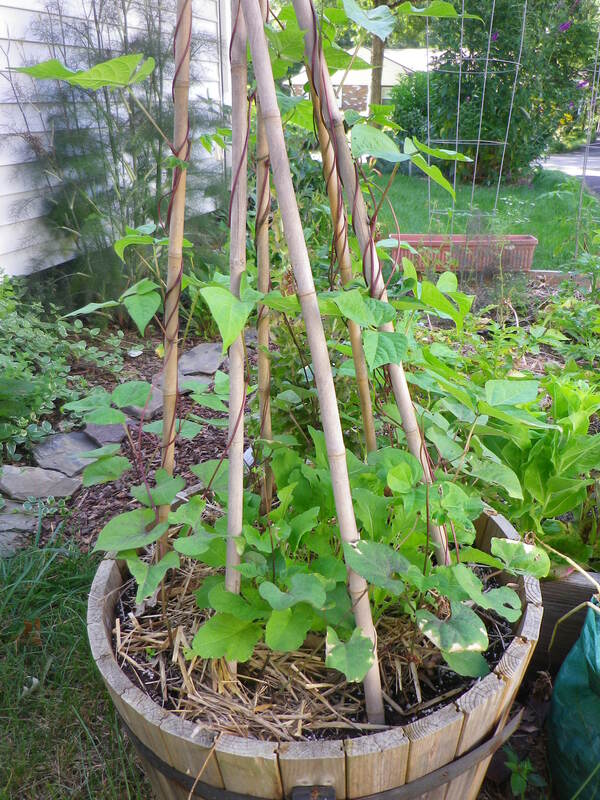 The purple Trionfo Violetto beans and the Round Black radishes from Pinetree Garden Seeds – the latter planted a bit late – are coming up in the whiskey barrel. 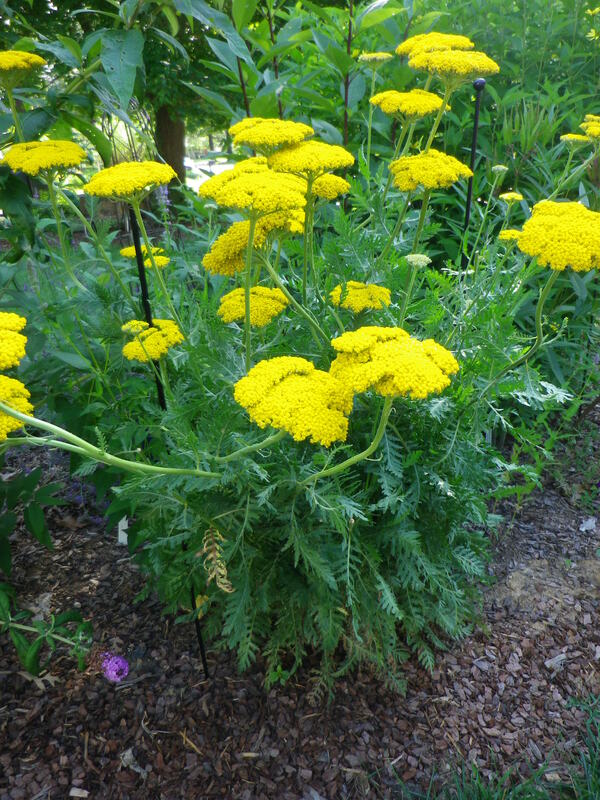 The sunny border is coming right along. 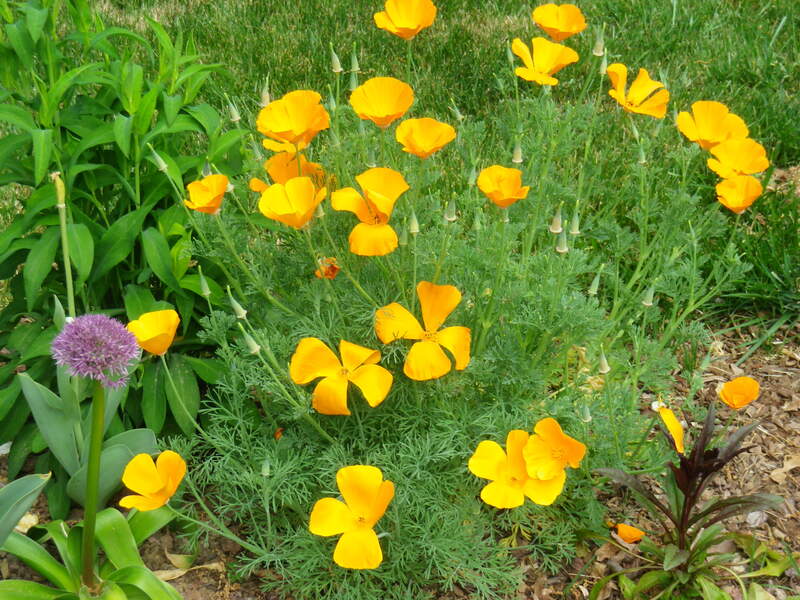 The California poppy, which I think I sprinkled around last summer, suddenly flared up into a huge and gorgeous orange surprise. Here it is in mid-April. 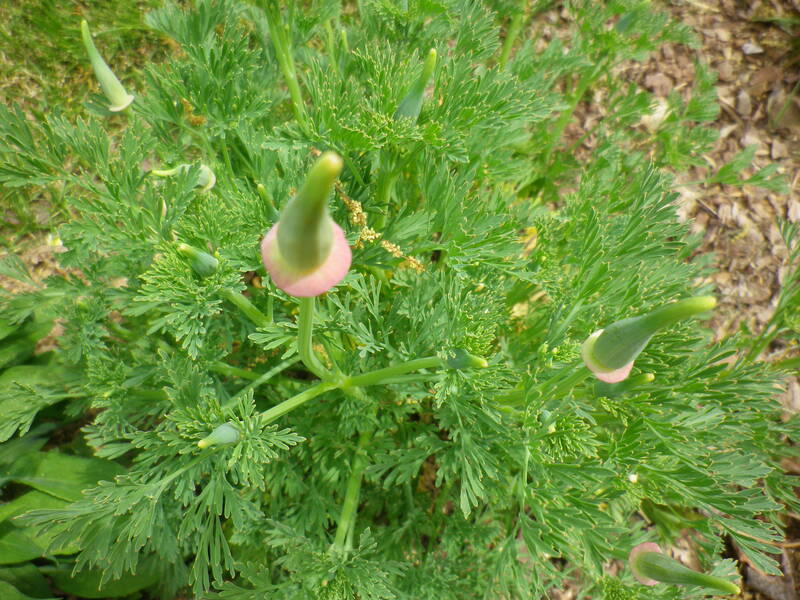 The buds are particularly weird and beautiful. 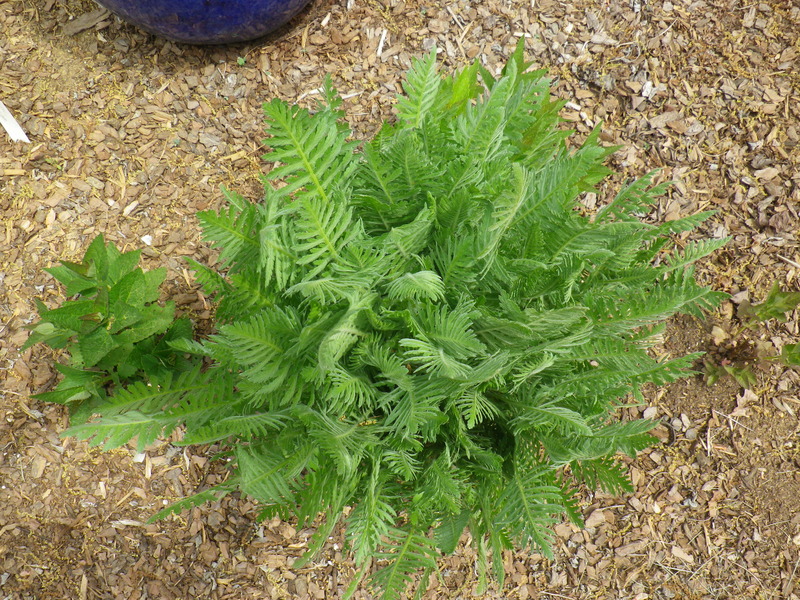 Then there’s the yarrow, which looks innocent enough in April. But it got so enormous that I had to stake it. And did I note what variety it is? No, I did not. ‘Coronation Gold?’ It’s almost as tall as the monstrous helianthus, which I cut back yesterday. 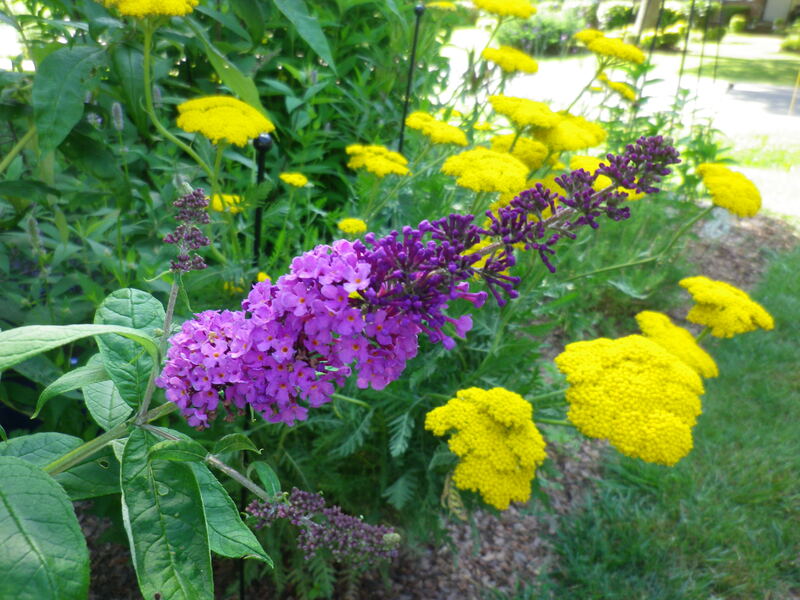 Although I do like the way it contrasts with the butterfly bush, which I whacked back in March and which is just now starting to bloom. The lavender (‘Grosso’) is throwing flower spikes every which way, and I’ve cut dozens of them already. Deliciously fragrant. 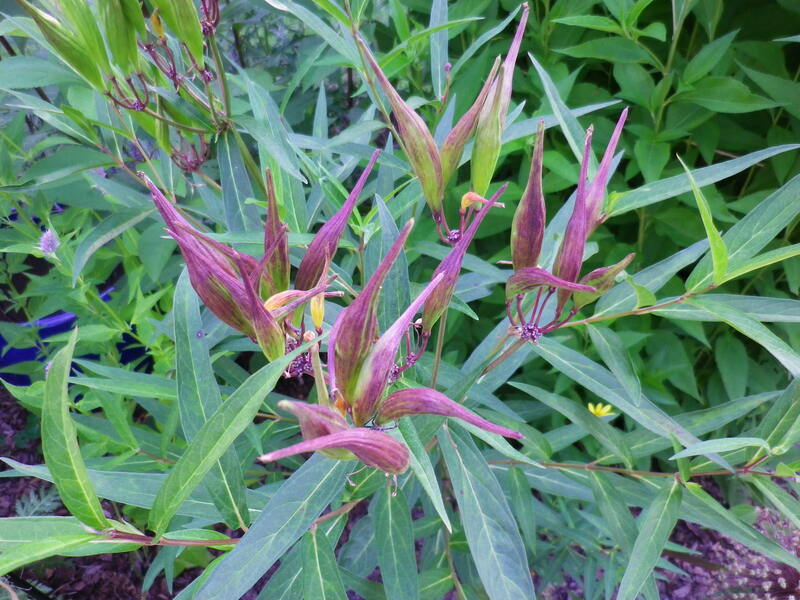 The milkweed has already bloomed (everything is so early this year), and now the seedpods are forming. No aphids yet, thank goodness. 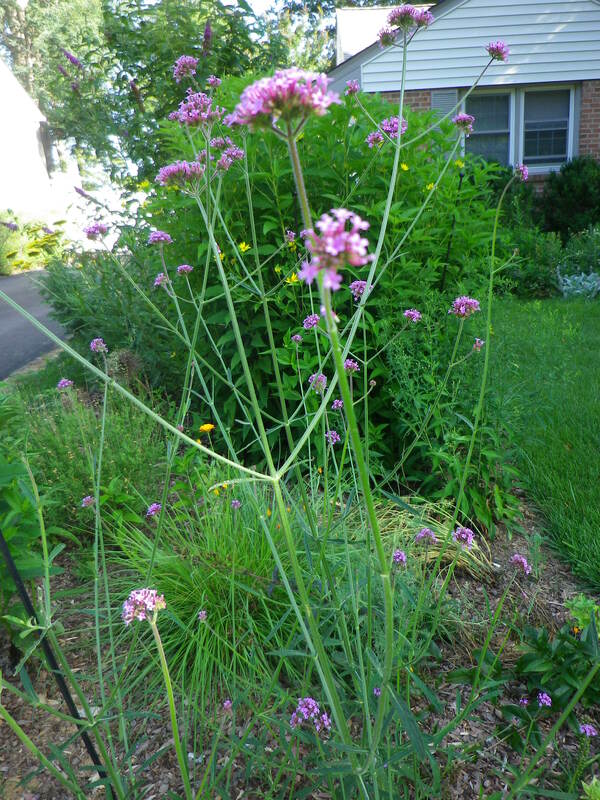 The verbena bonariensis, which I had admired in Mr. Darwin’s garden, arrived this spring and has just taken off. 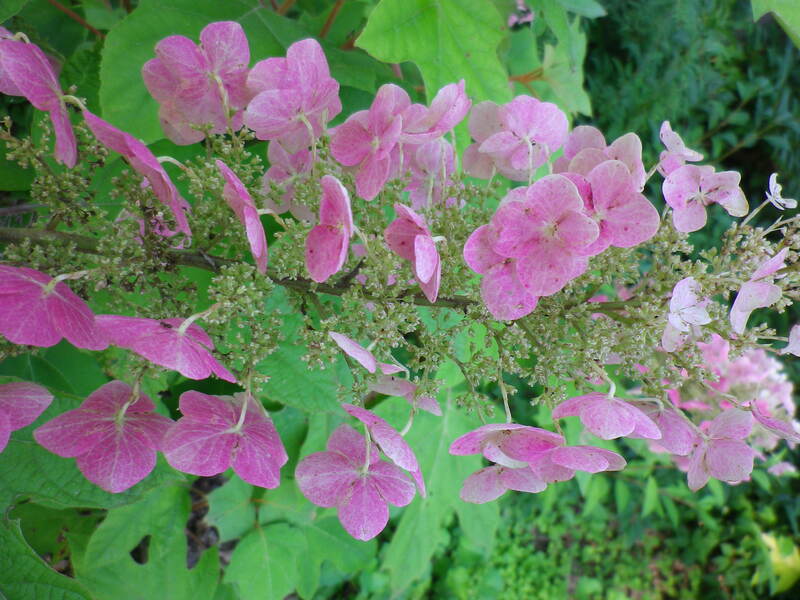 Meanwhile, the oakleaf hydrangeas have been spectacular this year. 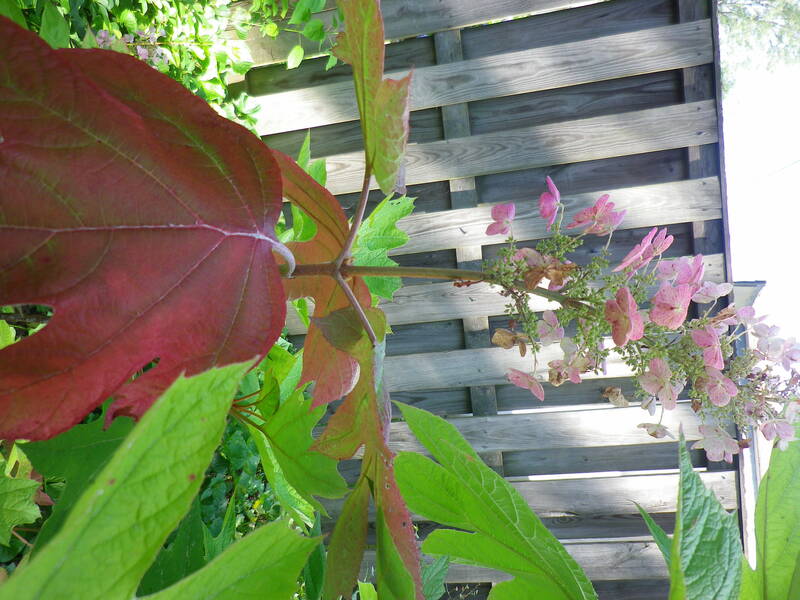 ‘Snowflake’ is just starting to go green, but ‘Alice’ is not only turning pink but changing leaf color, too. 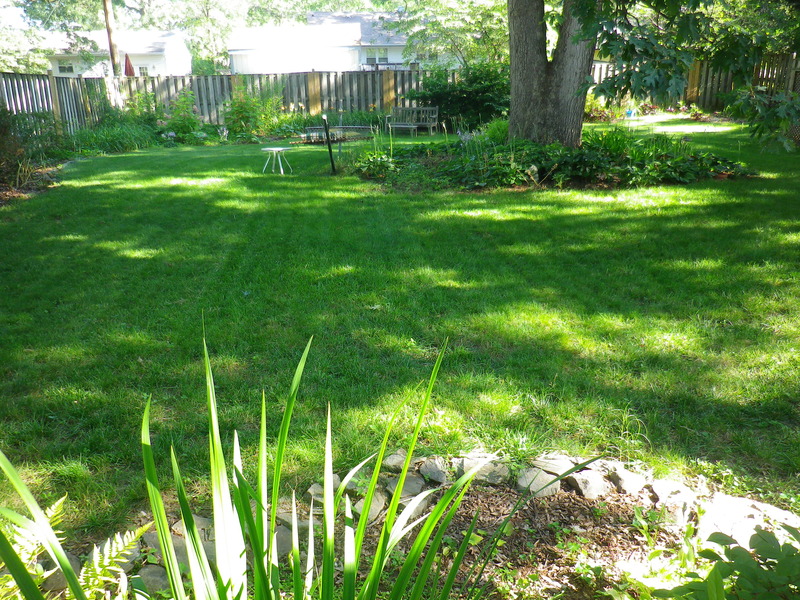 Best of all, the back yard is really coming into its own. The borders still need a lot of work, but it’s looking so much better than it ever has. See?